Sticky Password automatically fills login and password fields in web forms and usual dialog windows. It has an unique feature named "Sticky Button" which appears on any window that had password saved for. Careful backup feature will keep all your passwords safely stored until you will need them. 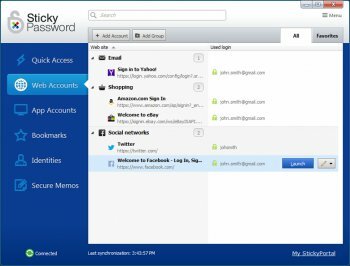 Also Sticky Password allows to have multiple logins and passwords for a single account and there are many other useful features. A Premium version is available for $19.99 per year. It includes additional features such as cloud sync, cloud backup, local Wi-Fi sync, and support. It works ok, if not a little too well. I found it fighting with me to input passwords, aggressively storing passwords I inadvertently changed or posting a page before I was ready. Messed up a few sites on me like that. I wasn't amused. It gets a 3 from me due to its over aggressiveness and poor browser support. Nice new color GUI, but.. very slow and bloated, earlier versions much faster. Users of previous version 6 need purchase new license to continue use Sticky Password.. I am using free app Sticky Password in my smartphone and it is really great. I recomend it. You can download it at google play. "Free" version limited. Other alternatives seems easier to use. Sticky Password FREE is limited to 15 password accounts and 1 Identity. Inability to import data from Roboform 7.2, even though it appears to offer a means to do so, kept me from taking this program seriously. No matter how many times I try I could not get it to accept data from Roboform even though I followed all directions to the letter. It looks like it could be a very good program for this task, but as I have hundreds of accounts being managed by Roboform, the inability to import this data severely limits Sticky Password's usefulness for me. I give it a 3 for usefulness as long as you don't need to import from their competitor's products. It loses 2 stars for being at release 5 without being able to do import this data successfully. I am not sure if the Sticky Password developers look on this site, but I might suggest import from CSV or Excel as well. V5 adds another usefull feature: secure memos.....Very nicely implemented! Bottom Line: It works ok, if not a little too well. I found it fighting with me to input passwords, aggressively storing passwords I inadvertently changed or posting a page before I was ready. Messed up a few sites on me like that. I wasn't amused. One of the best password managers around. I mean I'm in love with KeePass, but this one is amazing, I mean, it can unlock my database when I enter the room :| by communicating with my telly (thru BT). Now HOW COOL IS THAT?!!! :D This proggy is rock solid. setup and how to use windows. thought might be worth a look). pass, got a phishing alert and sticky notes crashed. not as easy as having FF remember 'em. bug me again? Hard work. As a beta program, a five. I tried a lot of password manager and this one is by far the best. You can keep password for Windows and Web Forms. Great application!